Cold Fusion Guy: On "supporting" the President - I'm no Ziba, I'm no Shimei! On "supporting" the President - I'm no Ziba, I'm no Shimei! I see Trump as a judge-like figure of the Old Testament Judges type. I say, Judge like, but pretty close to like them. He himself is not righteous, but he's doing a lot of great stuff for the righteous team, whether he believes in it or not, just like the judges. As you read this, I want you to understand that I know that God doesn't have a covenant with the United States of America. However, when you study the Old Testament major prophets, you read large sections on the judgment of the nations, where God has expectations of Gentile nations with whom He does not have covenant. Those nations, and the United States, are still responsible to God. People can be blessed of God depending upon what they do, because this is still our Father's world. You and I live in an anomaly of history for true Christians, the United States of America. True believers haven't had freedom like this. Jews haven't either for the most part, since the destruction of Jerusalem. I did not vote for him in the primaries - I did not even vote in the primaries. On the why see this and this. I have blogged negatively (prior to the election) about him. Famously "I will not vote for Donald Trump", Donald Trump: "the very embodiment of what the Bible calls a fool" and "Political sociopaths" - Vet Potential Candidates to Weed Out, Donald Trump "is a counterfeit Republican and no conservative"
While I donated to other GOP candidates, I did not financially support his campaign. Contrariwise: We donated to GOP Presidential campaigns going back to Bob Dole. I did not expect him to win! Since his election I have sometimes commended him and sometimes not. I was dead on in this prediction! Summary: To support someone means to: financially give to a campaign (which I did not), to vote for someone (ditto), to promote (say with a blog) and work for a campaign. Back to a previous point which is important: "Not even Presidents that I didn't particularly like, at times were right in my mind". Even Obama, whom I loathed, had his good points: he apparently has been faithful to his wife (in contrast with JFK as an example) and is a good father! Being born here (Fort Wayne in 1949), I am a US citizen. Many times I have watched a football game where I really don't care about the outcome. Most times actually. Elections are closely analogous to this. Theologically speaking we are in the age or "time of the gentiles" and soon that day will be fulfilled: Read about it in Daniel here and here. The Jeremiah illustration: "But seek the welfare of the city where I have sent you into exile, and pray to the Lord on its behalf, for in its welfare you will find your welfare"
Summing up: I'm in a foreign land (the good-old USA) and I want the good-old-USA to be successful because this is where I live. 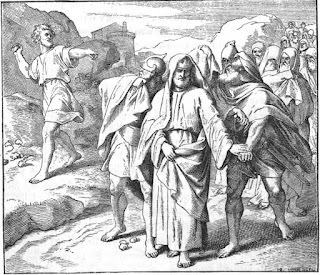 On Ziba and Shimei and the context - it's from 2nd Samuel 16:4-6 when King David was fleeing Absalom: "Ziba said, 'I pay homage; let me ever find favor in your sight, my lord the king.' When King David came to Bahurim, there came out a man of the family of the house of Saul, whose name was Shimei, the son of Gera, and as he came he cursed continually. 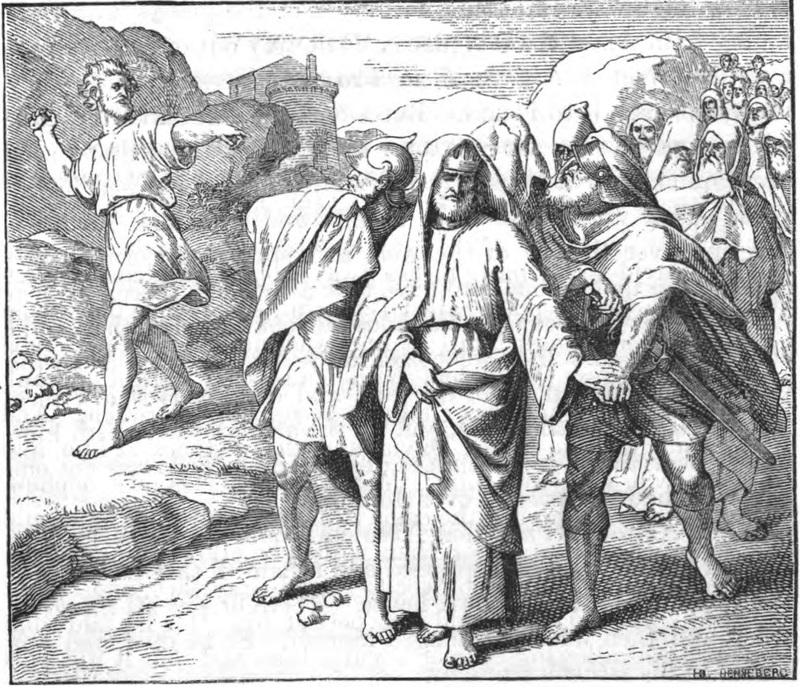 And he threw stones at David and at all the servants of King David, and all the people and all the mighty men were on his right hand and on his left. And Shimei said as he cursed, 'Get out, get out, you man of blood, you worthless man! '" Nor am I a Shimei! JP, I'm not saying I'm any better than him, and don't mean to throw stones, but do you say that Obama was faithful to his wife because gay bathhouses don't count as affairs? Do homosexual liaisons in general not count as being unfaithful? Why do some Christians get all up in arms because Trump has been divorced, yet said nothing about the bisexual Republican candidate(s) who ran? I've never understood that. What's your reason for thinking this happened? There are a lot of "Hillary barbecues babies" stories which distracted greatly from provable corruption. Jim, please tell me you're kidding. I don't know anything about "Hillary barbecue babies" or what that even means. But since you brought it up, the trail of bodies behind the Arkansas people is pretty long, going all the way back to the days when the Reagan/Bush administration was running drugs through Mena. Granted, that was a federal thing and not a state thing, but it's hard to believe that the federal operation could have worked without state complicity. I certainly don't agree with everything about Trump, but do you seriously think that the level of corruption was "equally balanced" and it was a luck of the draw between the two candidates? Seriously? Jim, I want to make sure I understand where you are coming from. Do you think that it's ok to be engaged in homosexual trysts at gay bathhouses because that's just a minor thing for the night and not a full-blown, ongoing affair? A lot of people do have this point of view, so you are not alone if you think this. Is this why the bisexuality of the candidates on both sides doesn't even seem to be a concern? Is Trump bad only because he was divorced? Re: "mp, but do you seriously think that the level of corruption was "equally balanced" and it was a luck of the draw between the two candidates? Seriously?" I concur the Clintons are corrupt. Re: "Do you think that it's ok to be engaged in homosexual trysts at gay bathhouses because that's just a minor thing for the night and not a full-blown, ongoing affair?" Help me out - I really know nothing about this. Re: " Is Trump bad only because he was divorced?" I didn't vote for him but I think he is doing a good job. Jim, you mentioned that at least Obama was faithful to his marriage and that was a good thing. I would agree that being faithful is a good thing. I just find it humorous that a certain sect of evangelicals is against Trump for being "corrupt", which they mean as being married three times. I also find it humorous and odd that guys like the former president can be regular attenders at gay bathhouses in Chicago and still be considered "faithful" to their marriages. Does being unfaithful not count for quick, homosexual romps and only divorce is considered being unfaithful? And why do so many Republicans engage in bisexuality and somehow the same folks who criticize Trump for his marriage problems couldn't care less about that? Maybe I'm just too old-fashioned and am out of touch. Regarding the bathhouses thing, I read the allegations in WND, did not see any more legitimate/authoritative claims that Obama was homosexual and that Michelle was his "beard". I have very little good to say about Obama--I think he weaponized government agencies for his purposes--but I don't see clear evidence of this. Bike Bubba, let me guess, you also believe that the CIA is NOT the biggest drug dealer in the country and that Mena was not a major drug hub in the 80's, run the the government? Bike Bubba, I'm not a fan of his presidency either. At least that much we agree on. I like your posts here and enjoy interacting with you even if we don't agree on various topics. Anon, with regards to the CIA claims and such, Deming's dictum "In God We trust, all others must provide data" comes to mind. The data are simply not, IMO, in on this topic. Hence I can't prove it and I won't argue it. So would you agree with someone who said he believes that those Christians voting for Trump sold their souls? Joanne or Jim, do you think you could say someone sold their souls to Goldman Sachs and the almighty dollar if they voted for Ted in the primaries? I just couldn't pull the trigger on that guy, but I had no qualms about voting for Trump. It doesn't bother me if someone voted for Trump. Many of my own relatives did. Both major candidates had a history of corruption and spoke in opposition to various elements of the Bill of Rights. They both promised to govern in ways different from how they lived and spoke. I don't blame anyone for weighing the relative dangers of these two and making their best effort to minimize the damage by voting for the least worst. What I strongly object to is whataboutism, which damages the credibility of positions I support, redefinition of Christianity, and defending immorality. Kevin Bauder (Nick of Time / 1/5/18): Christians in secular civilization should aim to pattern themselves after Daniel and the Hebrew children in the Babylonian court. They should remember the counsel of Jeremiah 29:7, to seek the welfare of the city in which they live as exiles. They can and should participate up to the point at which participation requires disobedience to God. As a result, they may sometimes be promoted or they may sometimes be cast into the furnace. In either event, their circumstances and godly responses will place their faith, values, and priorities on display. Jim S., I agree with you that Trump has done some things that are not good and anti-constitutional such as loading up appointments with members of the CFR. On the other hand, a president has limited powers as well, so some things he can't help, even if he wanted to do them differently.